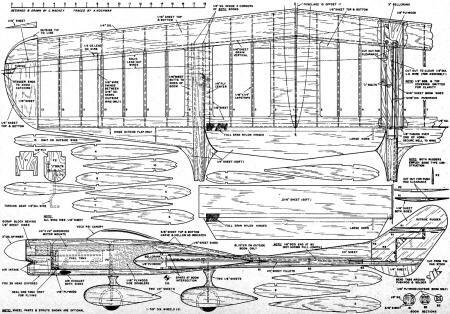 The Carousel is one of those C/L model airplane designs that, after reading the description, you wonder how it was able to flown to a first place finish at the Nats. It is full of oddball gadgetry and implementation techniques, beginning with the twin boom configuration and a long nose moment arm. The flaps are a 3-piece deal with the center section coupled directly to the elevator bellcrank as is normal, but the outboard flap sections were controlled independently by a weighted pendulum arrangement that was intended to adjust automatically based on the direction the model is pointing. That, along with the pair of 90° bends in the elevator pushrod that was prone to severe distortion under load, had to have made control of the Carousel very difficult. The conclusion as to how the ship was flown to first place has to be the superior piloting skill of Jim Vornholt. Imagine how good he must have gotten once he could afford a better airplane. There is no doubt the Carousel looks cool, but a modern day competitive stunt ship it is not. 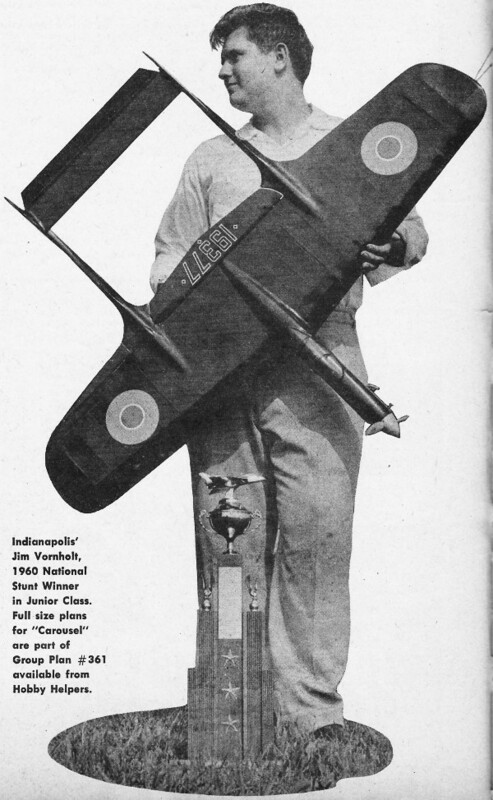 Meet the National Junior Stunt Champion and his winning aerobatic sensation ... "Carousel"
Indianapolis' Jim Vornholt, 1960 National Stunt Winner in Junior Class. Full size plans for "Carousel" are part of Group Plan #361 available from Hobby Helpers. Jim Vornholt lives within walking distance of the local flying field, so he found it easy to become interested in modeling. We have many excellent junior fliers in the Indianapolis area, and they all helped and inspired Jim as well as gave him some good stiff competition. It took Jim about a week to persuade his mother to let him buy a ready-built stunt ship from Lee Steinbrook. She gave her consent only with the understanding that if he tore it up that was the end of it, and there would be no more model airplanes in the house. Jim accepted the terms, bought the airplane, and made many successful flights and showed fast progress. Of course, the inevitable happened, he clobbered it. It's bad enough to lose an airplane, but to think you will never be able to have another one - well, who can blame Jim for a few tears. Ward Rutherford and his sons, Rickey and Dennis, are friends of the family and fortunately sympathetic model builders. They saw the crash and understood Jim's position so the repair team swung into action by picking up all the little pieces, then headed to the Rutherford workshop (formerly garage). A few days later the rebuilding was progressing satisfactorily, when Mrs. Vornholt decided to visit the Rutherfords. The model was covered with balsa, Silkspan, old rags and anything else handy while she was quickly maneuvered away from the area. Since then, Jim has learned to rebuild and has even designed a couple of stunt-ships. He built a Lark in two weeks! Jim's mother now understands about stunt flying and crack-ups and she has been a big help to him by driving him to meets when no other transportation is available. This includes his trip to the 1960 Nationals. Mr. and Mrs. Vornholt are proud of Jim and I don't blame them. He has gathered quite a collection of hardware, flying his Me-109 mostly, but now he prefers his Carousel. The twin boom designs do not fly better than the conventional designs, but they do fly as well. The main advantage is their unusual appearance. The Carousel is mainly an XP-design to test some new ideas. The airfoil and nose gear were changed to improve the landings. The front landing gear uses a torsion type set-up that improves landings on rough fields. Take-offs are still limited by prop clearance. The stab and elevator were moved out of the slip stream. Theoretically, this should be an improvement, but we don't believe it showed any advantage in performance. The biggest problem was getting tight smooth control to the elevator. We did this by using the braces shown on the plans, but had to pay for it in weight. 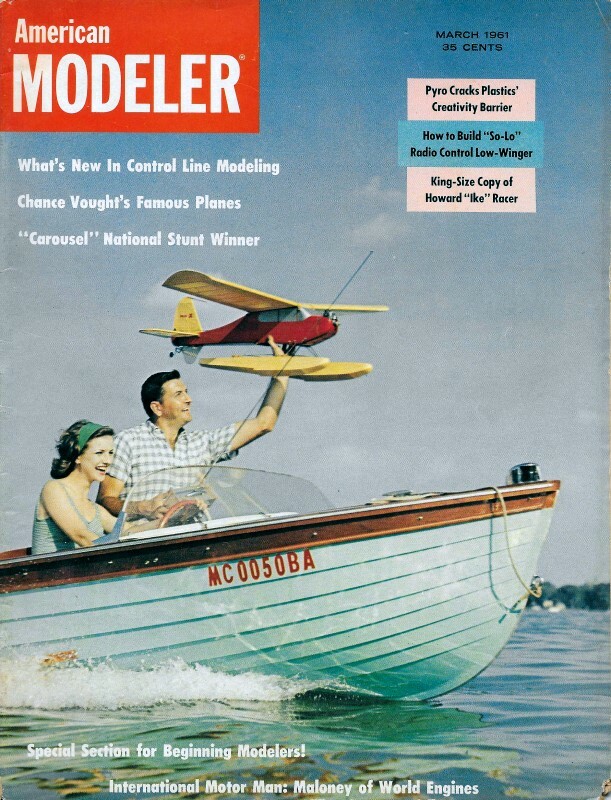 If you choose to lower the stab, mount it on wing or thrust center line and enclose control horn in hollow bottom rudder fin on the out­side. This will lighten the design a little. The third experiment was the weighted flap. The idea was derived from a free-flight pendulum control in a British magazine. I never tried it because I was never troubled by slack in my lines, and because I wasn't sure that would happen in a vertical climb. The idea was discussed with Lee Steinbrook and he didn't think the ship would be affected in vertical climbs, so he tried it on his ship. It worked perfectly, giving him line tension on 70 foot lines at an exceptionally slow speed in dead calm air. When tried on the Carousel, it worked well, but caused the wings to dip on the square maneuvers. This was cured by cutting the flap weight down to 1/5 of an ounce. 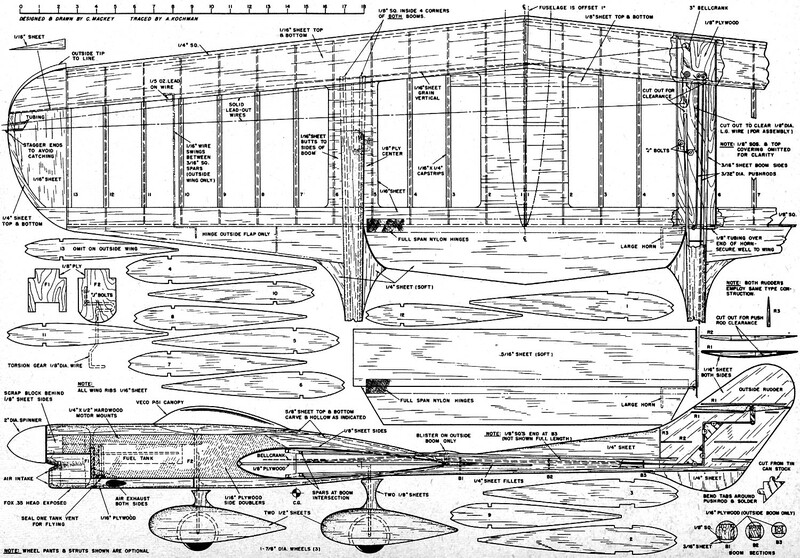 How well any stunt ship flies depends on five things: 1) design; 2) power; 3) weight; 4) control; and 5) alignment. If a proven design with adequate power fails to fly properly, it is due to one of the latter three mentioned above. Lightweight balsa: eleven pieces 1/16" x 3" x 36"; (1) 1/4" x 3" x 36"; (3) 5/8" x 3" x 36"; (3) 3/16" x 2" x 36"; (4) 1/8" sq. x 36"; (2) 1/4" sq. x 36"; (4) 3/16" sq. x 36"; (1) 1/8" x 3" x 36". Three 1-7/8" dia. wheels; 7 "J" bolts; 1/16", dia., 1/8" dla., 3/32" dia. wire; two 1/4" x 1/2" hardwood motor mounts; 3" bellcrank: 2 large control horns; 2" spinner; 2 leadout wires; canopy; bicycle spoke. Plywood, 1/16" thick and 1/8" thick; glue; plastic balsa; dope; sanding sealer; sandpaper; covering material; nylon hinges. The weight includes balance and wing loading. Balance plane as plans show, making only slight changes to suit your flying style. You can build a light ship by using the lightest wood available and still strong enough to do the job. Use just enough glue to hold tight, and a thin finish. Almost all over-weight airplanes can be traced to heavy or excess dope. It's not how many coats you put on, but how many you sand off that makes a slick, thin finish. Controls should be free, but snug. This is achieved by freeing each part of the control system as you install it. Never wait until the ship is finished to test the controls. If the controls are loose, tighten hinges and add braces to the pushrod where they are necessary. Alignment is very important! The wing should be warp free and parallel to the stabilizer. One way to do this is by assembling the model over a flat surface. Measure l.e. and t.e. of wing and stabilizer from the table. Block up the underside to hold proper position and weight the top side to hold it firmly. Glue the ship and recheck alignment to make sure the controls are working perfectly and allow to dry for about two days (if possible). Build the Carousel wing in conventional manner. Install bell-crank, push-rods and landing gears. Cut and glue together the sides and bottoms of the booms, leaving top pieces off. Assemble inside rudder and the outside half of the outside rudder and glue to booms. This leaves the inside half open to allow the elevator horn to be connected to the pushrod. Notch out booms for t.e. and slide between spars. To find the true position of the booms, we measure from the table to center line of booms. Then block up. Connect elevator horn to pushrod and secure stabilizer in place. Connect the wing flaps up and check all controls. Make necessary adjustments and then glue booms to wings and stab to rudder. Build the nose section and glue to wing, using the same method of alignment you used on booms. Then finish up all the loose ends. Make the fillets from plastic balsa as plans show. Sand to exact shape and fill all grain with sanding sealer. Sand smooth between every coat. Use the type of covering and finish you prefer. We employ Silkspan. The Carousel has been flown in high wind as well as dead calm air on 70 foot lines. Sixty-five foot lines are recommended in windy weather. They seem to cut down on bouncing. Jim doesn't like long lines on any design, so he flies his Carousel in a sixty foot radius.